People vote at a polling place at the lifeguard station in Manhattan Beach, California, on Tuesday. Higher minimum wages, legalized marijuana and abortion access were some of the focal points of our live blog coverage of the midterm elections Tuesday night, but there was one initiative we didn’t discuss: California’s Proposition 47, also known as the Safe Neighborhoods and Schools Act. The proposition, which passed, will reclassify drug and theft crimes that involve less than $950 from felonies to misdemeanors. Our chief economics writer, Ben Casselman, wrote this week about how the law’s passage would affect the job market, but a more basic question should also be addressed: Will it work as its proponents think it will? The California Legislative Analyst’s Office put together a report in July estimating the impact the proposition would have on the state’s prison population and incarceration costs, which the Center on Juvenile and Criminal Justice then expounded upon with additional data in September. Using 2012 as a baseline, the data shows that Prop 47 will result in about 40,000 fewer charges resulting in incarceration per year. In terms of space in state and county jails, that adds up to a lot of free beds, which also means a lot of money saved. The savings will go to programs for drug treatment, schools and victim services. 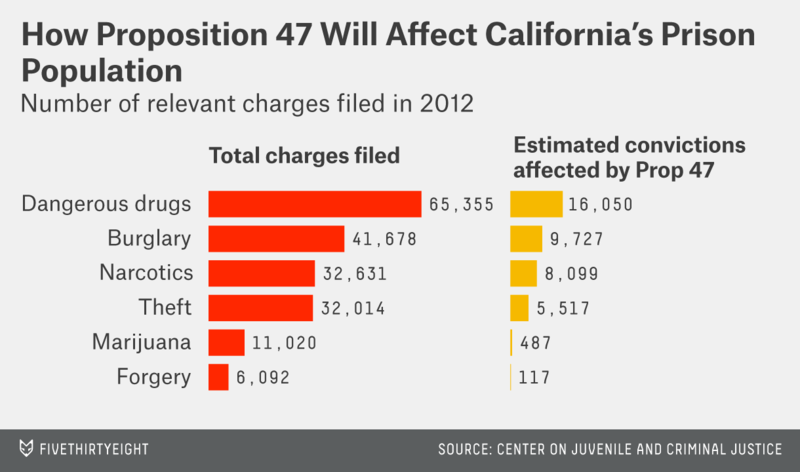 Prop 47 has received attention for its potential to “lead the way” on sentencing reform. With a population of 38 million, California is the largest state to implement this type of reform. But it’s by no means the first. So, how do these estimates compare to the states that already had similar measures in place? Arkansas: In 2011, the state passed Act 570, known as the Public Safety Improvement Act, which allowed nonviolent offenders to be sentenced to work with the Department of Community Corrections rather than be incarcerated. According to the Urban Institute, Arkansas reduced its prison population by 9 percent in 2012, and the state was projected to save $875 million by 2020 — that is, until the state implemented harsher sentences for parole violations. Now, the backlog of inmates being held at county jails is at “a historic high.” The state’s crime rate decreased by about 3 percent between 2011 and 2012. Georgia: In 2012, Gov. Nathan Deal signed into law a bill that allowed for alternative sentencing for low-level nonviolent offenders. By the end of 2013, the state’s prison population dropped by 14 percent, saving the state about $20 million. Georgia’s crime rate decreased by about 4 percent between 2012 and 2013. Kentucky: In 2011, the state passed the Public Safety and Offender Accountability Act, which allowed minor drug offenders to be sentenced to probation and treatment, and authorized earned compliance credits for parolees. The prison population increased by 9 percent in the following year, but the The Pew Charitable Trusts’ Public Safety Performance Project reports that Kentucky saved $29 million and a net 872 prison beds annually by the end of 2013 because of the law. The state’s crime rate increased 3 percent between 2011 and 2013. Texas: The state’s 2007 budget allocated $241 million for treatment-oriented programs for nonviolent offenders, which resulted in a 4.5 percent decrease in the state’s incarceration rate by 2008. The state has since saved an estimated $2 billion that would have been needed for increased prison resources. Texas’s crime rate decreased by 11 percent between 2007 and 2012. This is just a small sample of states that have enacted sentencing reform. Delaware, Hawaii, Kansas, Louisiana, Missouri, New Hampshire, North Carolina, Ohio, Oklahoma, Oregon, Pennsylvania, South Dakota, Vermont, Virginia and West Virginia have all passed measures aimed at preserving prison space for the most dangerous and violent offenders. As is clear from the four states mentioned above, results lean in the positive direction, but are ultimately mixed. Most of the remaining states’ laws were either enacted too recently to provide sufficient data, or their effectiveness simply hasn’t been investigated. There’s little debate over the fact that the United States’ rising prison population is a problem. But there’s argument over how to fix it: Opponents of Proposition 47 worried the costs would outweigh the benefits, and crime would increase under the law. But there’s little evidence to substantiate that claim — even in Kentucky, where crime increased in the wake of sentencing reform, the bump isn’t necessarily significant. At the end of the day, California was required to do something to decrease its prison population, and other states that have enacted similar measures have largely been successful. CORRECTION (1:52 p.m.): An earlier version of this story incorrectly identified the organization responsible for a report on Kentucky’s sentencing reform law as the Pew Research Center. It was the Pew Charitable Trusts’ Public Safety Performance Project.